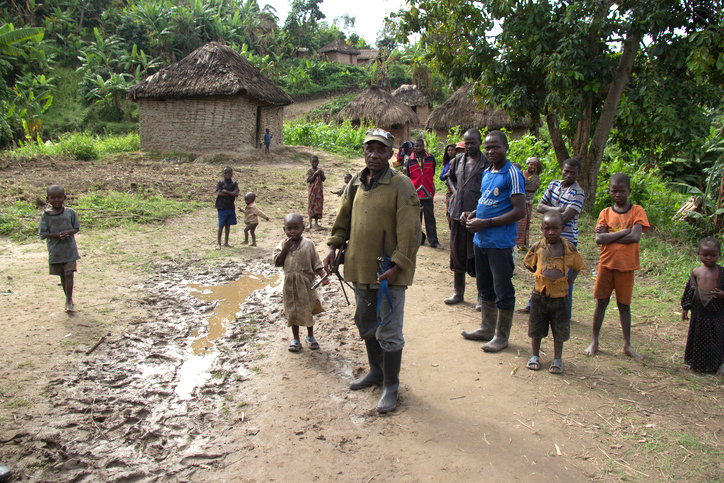 Chai, North Kivu, DRC- March 29, 2014: FDLR soldier walking with Rwandan refugees in Chai, North Kivu, DR Congo. In the months after the killing of al-Qaeda’s founder and leader Osama bin Laden in May 2011, the operational leadership of al-Qaeda was picked apart in Pakistan’s Tribal Areas by a very successful drone campaign. Al-Qaeda leaders Ilyas Kashmiri, al-Qaeda’s operational commander Atiyah Abd al-Rahman, Abu Miqdad al-Masri, and Abu Hafs al Shahri were all killed. They were followed in 2012 by al-Qaeda’s new number two, Abu Yahya al-Libi, and Shura council member Khalid bin Abdul Rahman al Husainan. In 2013, two more important al-Qaeda leaders were taken out: Sheikh Yasin al-Kuwaiti, who led external operations, and Abu Ubaydah Abdullah al-Adam, al-Qaeda’s head of counter-intelligence. Al-Adam was in charge of the newly formed Lashkar-i-Khorasan, which was taking action in North Waziristan against the growing number of infiltrations and leaks that had led to targeted killings of al-Qaeda and Taliban leaders. Following the death of al-Adam, many of his deputies and lower level commanders decided to leave Pakistan and move through Iran to Syria. This group became the expert core of al-Qaeda in Syria, better known as the Khorassan unit. Ayman al-Zawahiri became the leader of al-Qaeda in accordance with the bylaws of the terrorist organization. But he wasn’t able to turn the tide as the decline of al-Qaeda Central in Afghanistan and Pakistan continued. Meanwhile, al-Qaeda in Yemen flourished, despite the US strike in September 2011 on Anwar al-Awlaki, the prominent US citizen leader of external operations for al-Qaeda in the Arabian Peninsula (AQAP). From Yemen, AQAP has plotted and executed major international terrorist attacks. Most notably, in 2009 they included a failed attempt to assassinate Saudi Prince Muhammad bin Nayef and another failed attempt to bomb a US-bound Northwest Airlines flight on Christmas Day by Umar Farouk Abdulmutallab, the so-called “underpants bomber”. By 2013, it was clear that al-Qaeda’s main activities had shifted from South Asia to the Arabian Peninsula. AQAP leader Nasir al-Wuhaysi had become al-Qaeda’s general manager, associated with the number three position within the organization. He was later moved up to second when he was named deputy emir of al-Qaeda by al-Zawahiri. Another Yemeni, Nasser bin Ali al-Ansi, served as the deputy general manager within al-Qaeda’s global hierarchy. Both al-Wuhaysi and al-Ansi operated from inside Yemen and both were killed in 2015 by drone strikes in al-Mukalla, the capital of the Hadramawt province. At the very top of al-Qaeda, in the summer of 2014 it was widely believed within the international intelligence community that Ayman al-Zawahiri was hiding in a safe house in Rawalpindi, right under the nose of the Pakistani military leadership. The Pakistanis were deeply unhappy with the situation and feared a US-led “bin Laden” style raid on Pakistani soil, which would bring considerable pressure on the government. Numerous attempts were made, via intermediaries, to convince al-Zawahiri that it was best for everyone for him to leave Pakistan entirely. Initially Zawahiri refused. But in the months that followed, he was persuaded to leave and arrangements were put in place to ensure his safe travel to Yemen, which finally took place in early 2015. Before al-Zawahiri moved, a new al-Qaeda affiliate in South Asia was set up. In early September 2014, it was al-Zawahiri himself who officially announced that al-Qaeda in the Indian Subcontinent (AQIS) had been established. It was almost if he was preparing the ranks for the departure of the leadership of al-Qaeda from Pakistan. The Charlie Hebdo attacks in Paris followed in 2015. They were carried out by jihadi brothers Cherif and Said Kouachi. Both were AQAP operatives and Said had been trained in Yemen. Iranian assurances about the safe release of a number of senior al-Qaeda operatives were a key component of the negotiation process that led to Zawahiri’s departure from Pakistan. This proposal formed what has come to be known as a tripartite agreement between Iran, Pakistan, and al-Qaeda. According to a credible source within the international intelligence community, Iran’s role in securing the transfer of Zawahiri to Yemen was significant, with the Iranian Revolutionary Guards Corps – Quds Force (IRGC-QF) providing secure transportation to Yemen, most likely via Oman. Parts of the coast of Oman and Yemen are under control by Iranian special units from the IRGC and are often used for smuggling weapons and other contraband operations. Following the move of Zawahiri to Yemen, in early March 2015 Iran released five of its most valuable al-Qaeda “prisoners” in an exchange for Nour Ahmad Nikbakht, a mid-ranking Iranian diplomat who had been kidnapped in 2013 in Yemen. The released al-Qaeda men were Sayf al-Adl, Abu Mohamed al-Masri, Abu Khayr al-Masri, Khalid al-Aruri, and Sari Shihab. With the release of Sayf al-Adl and Abu Mohamed al-Masri, al-Qaeda regained two of its most experienced and feared operational commanders. They have played a major role in the re-strengthening of al-Qaeda. Al-Adl was previously head of al-Qaeda’s Military Committee, one of the group’s most senior security chiefs and a member of the Shura Council. He is also one of the most experienced explosives experts in the terror group and the architect of its program to obtain and use weapons of mass destruction (WMD), including nuclear materials. Abu Mohamed al-Masri, also known as Abdullah Ahmed Abdullah, was al-Qaeda’s operational commander for the 1998 embassy bombings in Nairobi, Kenya, and Dar es Salaam, Tanzania. Following these attacks, al-Masri served as the commander of one of al-Qaeda’s training camps in Kandahar, Afghanistan. Alongside al-Adl, al-Masri is one of al-Qaeda’s most senior explosives experts. He is also believed to be a member of the al-Qaeda Shura Council. Abu Khayr al-Masri served for a number of years as Ayman al-Zawahiri’s personal assistant before rising through the ranks and becoming a member of the Shura Council. He was tasked to oversee the activities of al-Qaeda in Syria together with Khalid al-Aruri, also known as Abu Ashraf. Al-Aruri was the brother-in-law and close confidant of Abu Musab al-Zarqawi. Al-Aruri was seen as Zarqawi’s natural heir and was the operational commander of the Zarqawi network at the time of his arrest in 2002 in Iran. For his part, Sari Shihab was involved in planning WMD attacks against US interests in the Middle East, according to a German Intelligence document. When the five arrived in Yemen, they all went to meet with the al-Qaeda leadership, including the emir al-Zawahiri and his deputy al-Wuhayshi. It became clear that al-Qaeda was well entrenched in Yemen, particularly within the conservative tribes in the Ma’rib and Hadramawt regions. In fact, the bin Laden family originates from the village of al-Rubat in the Hadramawt and bin Laden took his fourth wife from the village. Many Yemeni and foreign al-Qaeda fighters are intermarried with local women and part of the tribes, following the tactics of al-Qaeda when it sought to cement its influence and position in the Tribal Areas in Pakistan. There are connections with Sudan as well. When al-Qaeda had its headquarters in Khartoum from 1991 to 1996, there was frequent contact with affiliates in Yemen. In preparation for future operations in Yemen, al-Qaeda also transported weapons to Yemen and stashed them in caches. These weapons are now being utilized. After the five men were released by Iran, al-Qaeda in Yemen launched an offensive in April 2015. It began with the takeover of al-Mukalla, a port city and the capital of the Hadramawt province. Al-Qaeda fighters took control of the key entry points to the city and stormed the local prison to free around 300 inmates, including some senior al-Qaeda leaders. In addition, and importantly, the presidential palace in the city, the regional office of the national bank of Yemen, and the garrison were taken over, giving al-Qaeda vital access to financial resources and military hardware. After al-Qaeda secured al-Mukalla, its foes had to take action to stop its rapid growth. The US intensified drone strikes in Yemen and US special forces carried out multiple raids. In April 2016 al-Mukalla was retaken by Yemeni and United Arab Emirates troops. For Sayf al-Adl, the increased drone activity was a reason to leave Yemen. He did not feel comfortable staying and left for Somalia. A source with direct knowledge stated that he saw Al-Adl come ashore in Somalia. Since then, al-Adl has published two online instruction manuals, each around 280 pages long, detailing vital information on guerilla warfare and revolutionary strategy. In September 2015, jihadi sources reported that Sayf al-Adl’s son, Khalid, was extracted from the battlefield in Syria and reunited with his father in North Africa. This is not only a further indication that Sayf al-Adl is in Africa. It also demonstrates a wider call-to-arms from al-Qaeda operatives in the region. It is abundantly clear that since the release of the five, al-Qaeda’s affiliates, especially in Africa, have become demonstratively stronger. Significant developments have been observed in tactical proficiency and operational behavior. In Somalia, al-Shabaab has started attacking African Union Mission in Somalia (AMISOM) checkpoints, military camps, and barracks in an organized military manner and with increasing success. Recent attacks in 2016 and 2017 on Kenyan military camps inside Somalia have killed hundreds of Kenyan soldiers. The capture of weapons has become a major concern for AMISOM. The suicide bomb used in the 2016 El Adde attack by al-Shabaab was four times stronger than the bomb used in the attack on the US embassy in Nairobi in 1998. The total number of casualties in terrorist attacks has grown at an alarming rate. In the Sahel, in early December 2015 two al-Qaeda affiliates, al-Qaeda in the Islamic Maghreb (AQIM) and a split off from al-Mourabitoun led by Mokhtar Belmokhtar, declared that they had reunited in a move which was wholly unexpected in the international intelligence community. Up until that point, Belmokhtar had shown no interest in returning to AQIM. It is widely believed that an emissary at the highest levels within al-Qaeda, potentially Sayf al-Adl, brokered the reunification. In its first operation after the reunification, AQIM launched a coordinated attack on two luxury hotels in the center of Ouagadougou, Burkina Faso, on 15 January 2016. More than 30 people were killed and over 200 taken hostage. This was followed by an even more unexpected attack on the beach town of Grand-Bassam in Ivory Coast on 13 March 2016. Since the decline of the Islamic State in Africa, the Tuareg jihadi groups in the Sahel have all realigned themselves with AQIM, according to a well-connected source. In a recent meeting, various al-Qaeda aligned factions from the different North African countries came together and decided to set up a new terrorist outfit that will seek to kidnap Westerners for ransom. The focus of the new group will be on Tunisia and Egypt. Iran’s release of al-Qaeda’s five top commanders delivered a significant boost to the terror group’s presence in Yemen and affiliates across Africa and Syria. Al-Qaeda is once again a potent force, capable of launching lethal attacks across the Middle East and Africa. Al-Qaeda is an intelligent, highly organized and well-funded global terrorist organization. As seen in Yemen and Syria, it is adept at taking advantage of failed states to build and cement its presence, with support from the local community. It is also highly experienced in manipulating global and domestic political situations, with the role of Iran in releasing the five commanders an important example. With the pressure growing on al-Qaeda and its leadership in Yemen, al-Qaeda once more needs to prepare for an exit-strategy. Al-Qaeda’s headquarters cannot move to Syria as the jihadi infrastructure in Syria is not ideal for immersing within the local population. Al-Qaeda needs a tribal society with unchallenged hospitality rules that will protect its fighters and leaders. Tribal ethical rules, such as those in Afghanistan-Pakistan (Pashtunwali) and Yemen, are ideal as an extra layer of protection for al-Qaeda’s leaders. The natural choice in this respect would be the Tuareg tribal belt in the northern Sahel. We have reached a turning point – Ayman al-Zawahiri and the Shura Council of al-Qaeda have to decide to move ahead to Africa or return to Afghanistan-Pakistan.